Living with diabetes is no joke. It takes so much effort to be able to manage our blood sugar levels effectively so as to avoid further health complications. Aside from having myself checked up often and checking my blood sugar regularly, I also take advantage of opportunities that I know can help me manage my diabetes easily. One such opportunity is the Glucerna® 1-2-3 Challenge. The Abbot Glucerna® 1-2-3 Challenge is a free 12-week program that was specifically designed for people with diabetes. It incorporates 1) a healthy meal plan; 2) exercise; and, 3) specialized nutrition with Glucerna® Triple care to help diabetics manage their blood sugar levels, reduce weight and waist line, and support heart health. 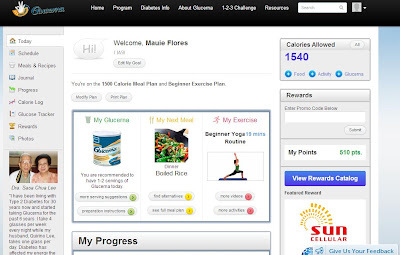 The program has online and mobile versions that diabetics can easily use. Both contain lists of recipes and exercises, and other online tools that make diabetes management easy as 1-2-3. 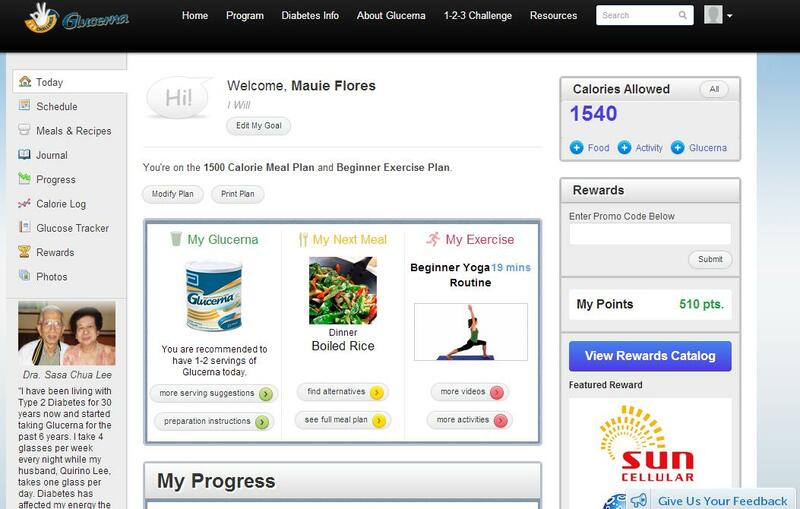 The image above is a screenshot of my Glucerna® 1-2-3 Challenge account in the website. As you can see, I am only allowed to have 1540 calories daily and this is because I set my program to the said calorie meal plan. This is the recommended calorie requirement for someone like me who's mostly sedentary. I also set my exercise routine to the Beginner Exercise Plan. Recommendations are also posted on the site according to the plan I set. There's also a reminder option for me not to forget to exercise and a Calorie Log to track my calorie intake. 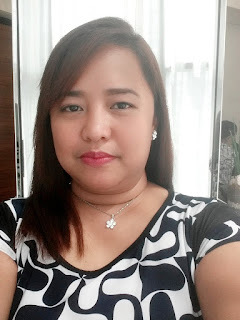 Lastly, it has a loyalty program that rewards points that I can use to redeem prizes such as Freestyle® Glucometer and strips and Mercury Drug® gift certificates. I just divulged my weight and age for the whole world to see. LOL! 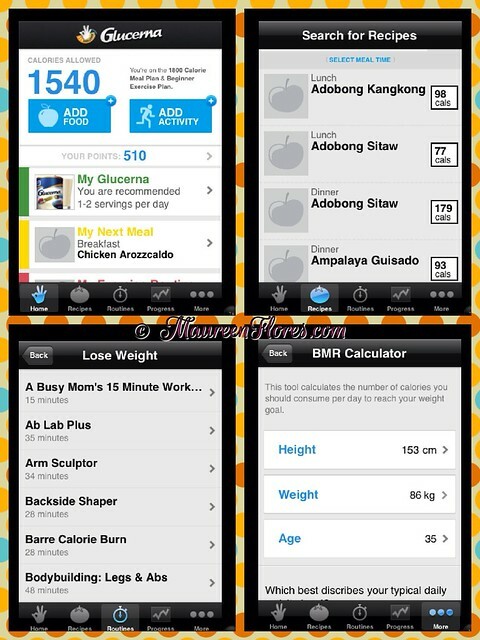 Meanwhile, this collage above is a glimpse of the Glucerna® 1-2-3 Challenge iPhone app that I downloaded. It's typically the same as the website version but, at least, I can easily access it through my phone or iPad. 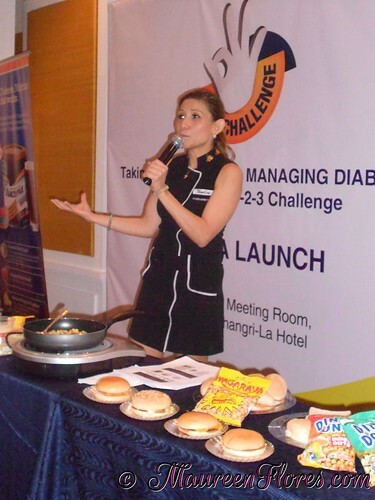 At the launch held recently, US certified Fitness Nutritionist and Chef, Nadine Tengco, taught us the basics of weight management through eating. Yep, you read it right, not through dieting but through eating. In fact, she recommends eating every 3-4 hours to keep the blood sugar levels stable. If the blood sugar falls beyond normal, the metabolism slows down and stores fat to save energy. The key, she told us, is to eat small meals at a time. Also, 1/2 of the plate should be composed of fiber, 1/4 of protein, and the remaining 1/4 of carbohydrates. It should pretty much look like the plate below. 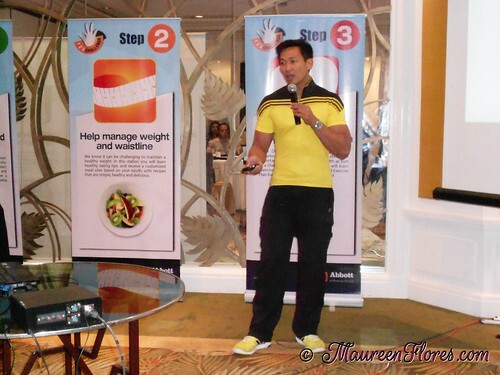 Coach Jim Saret also demonstrated his famous MetaFIT exercise that can make you burn at least 600 calories in 4 minutes. I'm already familiar with the exercise and I was successful in keeping the pounds off last year doing it. 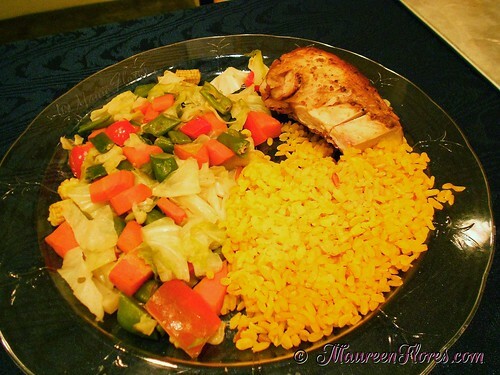 I'm going to do this again as an alternative to the exercises recommended by the Glucerna® 1-2-3 Challenge. 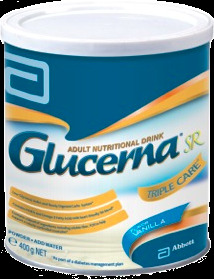 Since meal replacement is part of the plan, medical experts recommend replacing some meals with Glucerna® Triple Care. Glucerna® Triple care is has monounsaturated fatty acids (MUFA) and Omega-3 fatty acids that help support heart health and fructooligosaccharides (FOS) that help reduce weight and waist line. It's also sweetened with Sucramalt and has Chromium Picolinate so diabetics don't have to worry of blood sugar level spikes. 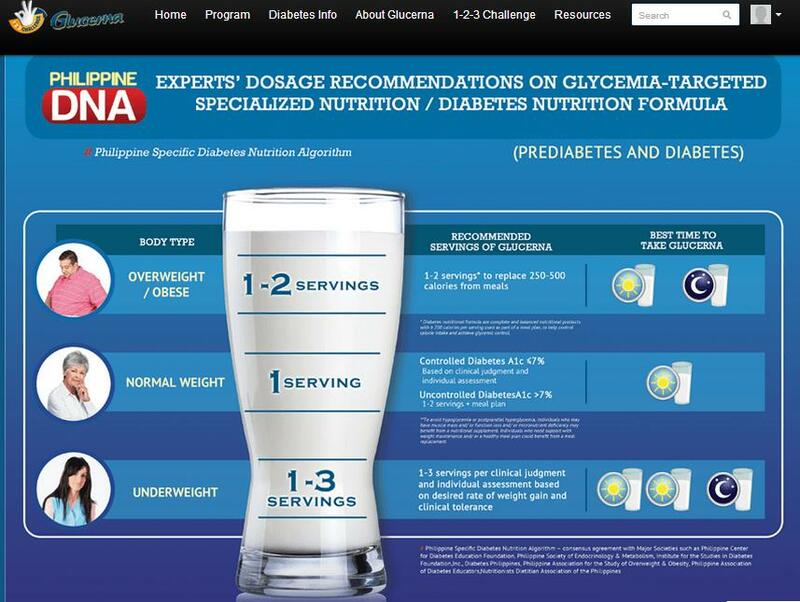 Managing diabetes need not be a daunting task for diabetics especially with the help of programs such as the Glucerna® 1-2-3 Challenge. I hope you can also find time to register you account and let's do this 12-week challenge together. Visit www.glucerna123challenge.com.ph or download the iOs or Android app.